Philips has informed customers that it’s working on patches for dozens of vulnerabilities affecting the company’s IntelliSpace Portal, a visualization and analysis solution designed for healthcare organizations. According to Philips, versions 7.0.x and 8.0.x of the IntelliSpace Portal are affected by issues related to insecure Windows service permissions, legacy encryption, and remote desktop access functionality. A total of 35 CVE identifiers are associated with the vulnerabilities. An advisory published by ICS-CERT describes the security holes as input validation flaws that allow remote code execution or denial-of-service (DoS) attacks, information exposure issues that allow unauthorized access to sensitive data, access control weaknesses that can be used for privilege escalation or code execution, local code execution and privilege escalation flaws, a code execution vulnerability that exists due to leftover debugging code, and multiple cryptographic issues. While some of these vulnerabilities appear to be specific to Philips’ product, many affect third-party components. For example, there are several remote code execution, information disclosure and DoS flaws related to Windows SMB, including the EternalBlue flaw exploited in the WannaCry ransomware attack. Other flaws affect the Microsoft Remote Desktop Protocol (RDP) and Microsoft Office. The crypto-related weaknesses include POODLE, BEAST and other vulnerabilities disclosed in the past years, including one from 2004. While exploits are publicly available for many of these vulnerabilities, they don’t specifically target Philips products, and the vendor claims it’s not aware of any attacks. Philips will release patches in the coming months. The company says it’s also currently testing operating system updates, which cannot be installed without ensuring that they don’t impact the stability of the product. Until patches become available, customers have been provided a series of workarounds. 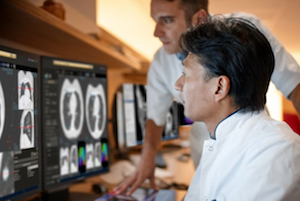 In January, Philips informed customers of an authentication issue affecting its IntelliSpace Cardiovascular (ISCV) cardiac image and information management system. The company learned from a customer that when the ISCV system is used with an Electronic Medical Record (EMR) in Kiosk mode and configured with Windows authentication, users may not be properly logged out once they are done using the software. The flaw allows a malicious actor that gains access to the system after it has been used by a legitimate EMR user to log in with that user’s credentials and obtain or modify sensitive information. Philips said the security hole will be addressed with the release of version 3.1.0. In the meantime, users have been advised to close the browser after accessing the system. Changing the configuration so that Windows authentication is not used also addresses the problem.